A Chess Olympiad in Norway? How sweet! There is still one player missing, right? What is his name again? 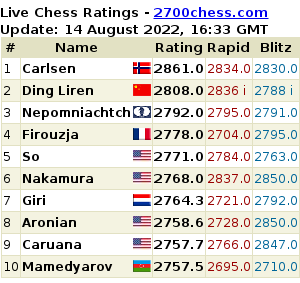 You can see that the battle between the 2700+ players in this Olympiad has begun, not only in the match of the day USA-NED. @Megalovic:” R3 highest combined Elo Aronian-MVL 5573 Nakamura-Giri 5532 Wojtaszek-Dominguez 5495 Topalov-Vallejo 5470 Leko-WangYue 5458″. We have some big matches today, and @GMJanGustafsson predicts: “ARM-FRA 1.5-2.5 USA-NED 2-2 NOR1-MNE 3-1 GER-ENG 2.5-1.5 POL-CUB 2-2”. Back to the games…and the blunder of the Olympiad? @jfernandez:“Canadian WIM Starr got mated in 8 moves against a 1500 player from Angola. That is just awful. 8. dxe5?? my god”. Yes, the women: @fallingsnowgirl: “Getting frustrated with the commentators ignoring the women’s games…”. There were some interesting matches in the women section today, e.g. Russia-France. Armchair grandmasters follow the games: @nvmea: “The evaluation in Milliet – Gunina has jumped to +4. On move 15. Blimey.” USA-China is another big match, with the game Irina Krush-Yifan Hou on board 1: @top40chess: “Hou Yifan is world #90 right now – but if she loses to Krush today, she drops back out of the top 100”. I spotted a few turnarounds today, e.g. in Aronian-Vachier Lagrave: @Josecmd: “Is Aronian stoned? White to move, he played Kd3. Totally ridiculous.” In Germany-Argentina (Women) @chess24.com tweeted: “Olympiad Ambass. Melanie Ohme turned her losing position to a winning vs Fernandez”. If you have the time, check the game Almasi-Yu (Hungary-China) and find out why @Unudurti tweeted: “Zoltan Almasi is the saddest man on the planet tonight”.